Following news of the election results, Lady Gaga, who’s been an outspoken supporter of Hillary Clinton, literally took to the streets in protest — specifically, the street in front of New York City’s Trump Tower — early this morning. 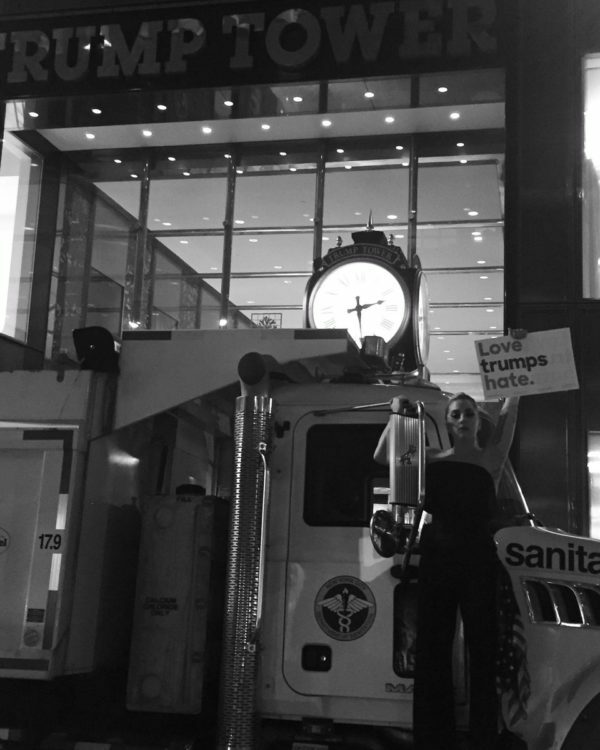 She was photographed outside the building, standing on a sanitation truck and holding a sign that read “Love trumps hate”. Miley Cyrus has also made a tearful response to Donald Trump‘s emergence as president-elect. Cyrus shared a video on her Facebook Page on Wednesday. “So, probably like most people – well, maybe not, because given the result – maybe I really am different and maybe a lot of people that I’m surrounded by think with open minds and open hearts like I do,” she began. “I still think that, in (Hillary’s) lifetime, she deserves to be the first female president, and that’s what makes me so sad. I wish she had an opportunity because she fought for so long and because I believe her when she says that she loves this country. This is all she’s ever done; she’s given her life to make it better. Hopefully we adjust and we accept everyone for who they are, and, so, Donald Trump, I accept you. This hurts to say, but I even accept you as President of the United States, and that’s fine, because, now, I want to be a hopeful hippie. I want to be hopeful that you will step in, too,” she added.